Stories have shaped my life as a young girl, and continue to do so. Many of life's greatest lessons, I learned from the stories of others. As a youth, I began to collect my stories and the stories of others through journaling. Journaling has been a means of growth, clarity, and healing for me over the years. It has been my passion to share my love of journaling with others. For this reason, Journal Junky® was created. It is my desire to empower the lives of women through journaling and story. As a woman, I realize that we many times have misgivings when it comes to sharing our stories. For a number of reasons, we feel ashamed, embarrassed, or inadequate when in reality, we all have a story that someone needs to hear. Once we release our inhibitions, we begin to realize that our stories truly hold magic, beauty, and power to inspire, motivate, and help others. I seek to inspire women to embrace & share stories, through journaling tips, groups and workshops. The city of Bombay bustles with life. North of the city center lies some quiet havens where space exists for your thoughts to abound as the waves of the Indian Ocean crash the shore. This girl and her mother live in one of these quiet havens that erupt into excitement during weddings and festivals. 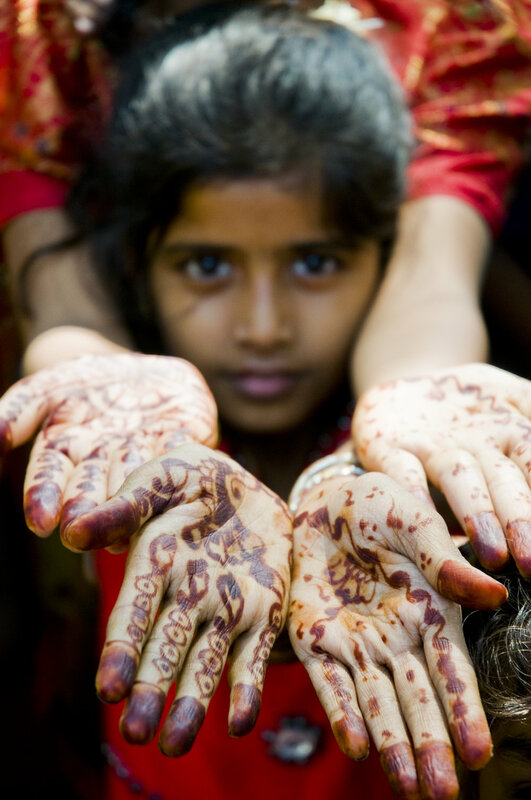 The henna on their hands is temporary but is part of intimate ritual and worn by the bride’s family for her wedding. It is the writing of the ancient designs for the well wishes to the bride for a happy marriage and fulfillment of her dreams.